Booking a Gatwick Airport Taxi or Private Hire Minicab Transfer can be done at any time, day or night, our service providers are available at all times to help you get to where you are going, anywhere in London, the Home Counties, or even further afield. Hiring a private taxi or minicab allows you the added comfort of a pre arranged vehicle and a driver after a long flight and removes the aspect of waiting around when travelling by coaches or trains. Simply put it's the complete door to door service. Totally Driven has a rich experience in facilitating transfer services from London Gatwick Airport in Taxi's and Minicabs. For more than decade we have been helping serve travellers in getting them where they want to go. We strive to facilitate a prompt and comfortable transportation service in vehicles of a high standard. Drivers meet passengers with a name board at Arrivals. We have a committed & highly helpful team in our 24/7 contact center who monitor flights and service providers to comply with our time standards thus reducing waiting time and of course the cost for such a service is reasonably priced. See how much you can save, make use of our Airport Taxi Transfers service. Heathrow, Gatwick, Luton, Stansted and London City airport. Book online at Totally Driven & hire private taxis or minicab transfers to or from Gatwick Airport. If you are travelling in a large group, or have children to consider, an Airport Taxi Transfer make sense. Child/infant seats can be requested, but are subject to availability. * Fares & Journey times are approximate & will vary subject to the exact date, time and collection postal code. There are many top hotels within the vicinity of the airport. These are well connected to airport, both North and South Terminals. You might just want to have a laid-back stay before you travel again. Airport shuttles are available at most of the hotels that are very close to Gatwick airport. For a quick bite between flights or to have a relaxed meal after a long flight, you can try the restaurants in the airport complex or venture out to unwind and experience the neighbouring areas. Some of them are Jamie’s Italian that offers rustic Italian food at affordable prices, Comptoit Libanais offers authentic Middle East flavours, Garfunkel’s offers multi-cultural cuisine in a contemporary setting, Armadillo offer the great tastes of South West USA, Yo Sushi for Japanese, Asian and Thai cuisine, La Brasserie with French essence is great place to try; Jai Ho and New Fort Raj offer Indian Cuisine and a variety of restaurants to cater to every taste. You can visit the neighbouring areas of attractions if you have enough time between flights. Bear in mind that to visit and enjoy these places leisurely you need enough time to travel to and from. Gatwick Airport taxi service can come in handy to enjoy a quick visit in comfort. For all your travel needs in London Totally Driven can be your friend in need. The airport is well connected by road with the M23 at Junction 9 and the A23. The National Express coach service operates at very regular intervals and tickets can be purchased at the ticket desk in both the terminals. All vehicles are wheelchair accessible. Easy bus operates between London and Gatwick Airport. Buses do not accept cash payment; instead you can use an Oyster Card or Visitor Oyster Card or a day travel card to make your journey. Oyster cards can be obtained by post when you book online, and you can pay online as you go. Oyster card is a smart card that enables you to travel on tube, tram, bus, London over ground, rail and River Bus. Oyster Card may not be relevant if your stay in London is very short. All fares are subject to change according to time of the day, direction of travel and day of the week. Apart from these, people can make use of their own cars and park at the Terminals Car Park for a fee. Trains are also accessible, Gatwick Express connects with Central London at Victoria and there are direct services to London Farringdon and Clapham Junction. 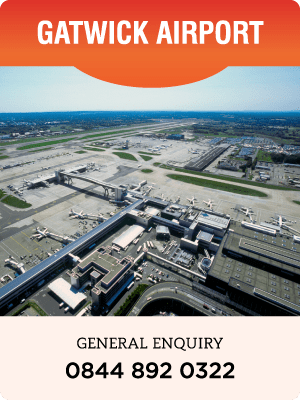 Gatwick Airport is the second busiest airport in the United Kingdom with more than 42 million passengers using it annually and travelling to over 220 destinations across the globe. Gatwick Airport is one of the UK airports that are committed to environmental aspects such as energy, water use, air quality, waste management, biodiversity and carbon emissions, with the aim of becoming a fully sustainable airport. The airport has two terminals North and the South. They are close to each other with an inter-terminal shuttle running every few minutes. Restaurants and shops are present at both terminals for the benefit of the travellers along with facilities like play areas, feeding and changing area, business traveller lounges and Wi-Fi connectivity to enhance the travel experience at Gatwick Airport. Passengers who have a layover between flights or need to catch a connecting flight at another London airport, or have to go to other destinations such as seaports, hotels, or restaurants, tourist attractions or anywhere in the United Kingdom for that matter, can make use of the rail, buses, coaches, taxis or private hire minicabs to reach their destinations.